HarvardÃ¢â‚¬â„¢s bet has proven prescient. The $39 billion fund, among AmericaÃ¢â‚¬â„¢s biggest endowments, now values its vineyards at $305 million, up nearly threefold from in 2013, while its overall natural-resources investments have done poorly. Investors who see agriculture as a proxy for betting on water include Michael Burry, a hedge-fund investor whose wager against the U.S. housing market was chronicled in the book and movie Ã¢â‚¬Å“The Big Short.Ã¢â‚¬Â In a 2015 New York Magazine interview, Mr. Burry was quoted as saying: Ã¢â‚¬Å“What became clear to me is that food is the way to invest in water. That is, grow food in water-rich areas and transport it for sale in water-poor areas.Ã¢â‚¬Â Mr. Burry declined to comment. matters because we interfere with nature at our peril. home, think of where it came from, and how much is left. Blue Sky Alternative Investments has defended the strategy behind its water fund, saying there is no impropriety involved and that it could not move the market for water rights in its trading activities. Acting Blue Sky boss Kim Morison told The Australian Financial Review's Chanticleer column on June 27 that Blue Sky accounts for only 10 or 20 per cent of transactions in the entire Australian water market. In the same interview, he acknowledged "there is a rumour around that this is a Ponzi scheme", which he forcefully rebutted and Blue Sky backed up in a separate update on Tuesday. "Blue Sky actively limits its deployment of committed capital to prevent artificial inflation of market prices over time," the company said in an ASX statement. On the basis of its "relatively low level of monthly turnover", Blue Sky "rarely outbids irrigators in the various regional water markets". Irrigators are the end users of water. ..Water market experts supported the view that investor participants could not corner the market, which is dominated by irrigators and government owners. Alister Walsh, director of water at Duxton Capital and manager of the ASX-listed Duxton Water, estimated that state and Commonwealth governments held around 30 per cent of the rights in the Southern connected system which covers the Murray Darling. "Of the roughly 70 per cent of rights that are left, the majority are held by irrigators themselves; using the data available to us we estimate only 3 to 5 per cent are held by investor groups, like Duxton Water," he said. "Groups like ourselves which are coming into the market, not looking to use the water for production, are able to provide alternative water supply solutions (like long-term leases) that are supporting the development of further agri-production in these regions. For irrigators, their decision on what to pay for water comes down to the economic return per megalitre that they can generate in their respective industries." Colliers International's Rural & Agribusiness director of valuation Shaun Hendy said he had noticed certain changes to what farmers were doing with water. "There are structural changes going on which would account for the changes in usage and that includes an increase in high-valued permanent tree plantings and the transition from traditional irrigated rice production to irrigated cotton Ã¢â‚¬â€œ which uses less water per hectare basis," Mr Hendy said. "We have observed that as part of the structural change in rice growing to cotton growing, irrigators are using less water and selling surplus water into the temporary water markets." "There may also be a decrease in farms that irrigate because they may have sold the water to the government or the farms might have amalgamated." Australian farmers are using about 23 per cent less water for their food and fibre production than they were just three years ago with government water buybacks, structural changes, and seasonal conditions all playing a key part in the overall reduction. 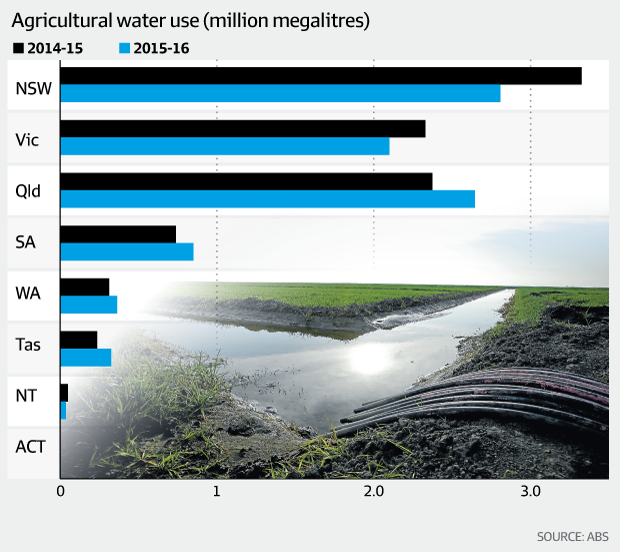 In the year to June 2016, about 85,000 farming enterprises used 9.2 million megalitres of water Ã¢â‚¬â€œ or about 3.7 million Olympic size pools Ã¢â‚¬â€œ for their crops, horticulture and animals. That figure is down from the 11.9 million megalitres used in the year to June 2013, according to the newly released data from the Australian Bureau of Statistics. The majority of water used on farms is for irrigation and that figure has also reduced to 8.38 million megalitres from 8.95 million megalitres in June 2015 and 11.1 million megalitres in the year to June 2013. The water use is likely to continue to reduce as farmers make changes to the way they farm and the government continues to take water out of the system. Last month the Commonwealth government purchased all 21,901 megalitres of Tandou's Lower Darling irrigation water entitlements south of Menindee, NSW for $78 million from listed group Webster as part of the government's plan to decommission the Lake Tandou irrigation system which had been used for irrigated farming. At the high-tech end of the water sector, Israeli firm and ASX listed Emefcy Group (EMC) has developed a Membrane Aerated Biofilm Reactor (MABR) product that enables wastewater to be reused for specific purposes such as crop irrigation. Emefcy has designed its technology for remote areas, invariably in poor parts of the world that suffer from severe water shortages. The company announced it has three new commercial agreements in China and investors lifted the SP 27 per cent so far since the beginning of May. "Anything that looks to contribute solutions to China's extremely serious water issues is likely to receive investor interest," Tom King, chief investment officer of Nanuk Asset Management, said. "But a lot of these smaller companies have a lot of value ascribed to the future." The Alternatives Fund's investment in the Blue Sky Water Fund increased 1.35% in January, with Water Entitlement values strengthening across most of the portfolio during the month. NSW general security Water Entitlements were the best performers with some prices rising 6% over the month. Current inflows remain above average which is assisting to build momentum towards higher water availability for next season. Deliveries of Goulburn Inter Valley Transfers commenced in January. These IVT deliveries reopened the opportunities for temporary allocation trade out of the Goulburn valleys into the Murray system. This has been the catalyst for the temporary price decline (-2.23% for one month; -0.11% for 3 months). However, if dry conditions persist and current maturation of crops and/or carryover demand improves, a new price floor may emerge.